Having trust in your data is not just about removing risk and maintaining compliance. It can be a way to foster innovation and growth. 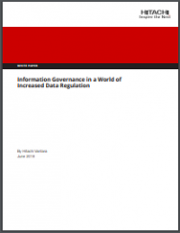 Read this white paper to explore examples of how a robust information governance program helps you understand the value of the data in your enterprise and how to use it for business advantage.